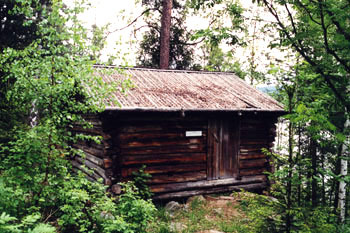 The watermill (skvaltkvarn) dates from about 1885 and comes from a site where mills have been found since the 17th century. The waterwheel had a vertical wheel axle that was adjusted to function in low water with a good fall, such as could be found in many forest streams. This mill was in use until about 1905 and was donated and moved to the homestead museum in 1927.